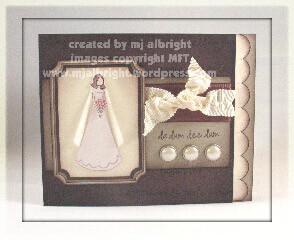 I used MFT Going To The Chapel stamp set for this card. 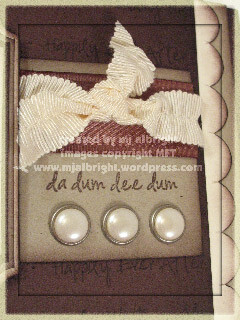 Check out this set…there are so many cute images with tons of sentiments. I used every sentiment from the set on this card. The main sentiment is “da dum dee dum” and all the others are on the Chocolate Chip CS base. The main image is really neat. I wanted the dress to be white but wanted a Very Vanilla CS background. I stamped the image two times on Papertrey White CS: one with Brilliance Graphite Black ink and the other with Close to Cocoa ink. The Black ink image — I colored in the hair, body, and flowers & carefully cut out. The Close to Cocoa image — this is the dress. I then stamped the image again on Vellum with Opaque White Stazon Ink — this is how I created the veil. On a piece of 1-7/8″ x 2-5/8″ Very Vanilla CS, I pieced the image together. Because the bride was 2 pieces, this also gave me the ability to make the bouquet pop out (I stacked 3 mini-glue dots on top of one another beneath the flowers to create dimension). 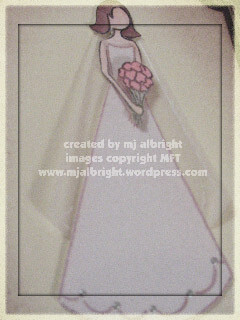 Finally, added little beads of Liquid Pearls (silver) the the bottom of the dress. CARDSTOCK USED: SU! Chocolate Chip, Very Vanilla, and Kraft CS; Papertrey White CS; Vellum. INKS USED: Brilliance Graphite Black; Stazon Opaque White; SU! Chocolate Chip, Close to Cocoa, Blush Blossom, and Pretty in Pink Classic Stampin’ Pads. ACCESSORIES USED: Slit Punch; Chocolate Chip Satin Ribbon; Beachfront Ribbon Originals; Aqua-Painter; Stampin’ Sponges; Ticket Corner Punch; K&Company LaBoutique Wedding Pearl Brads; Liquid Pearls (silver); Mini Glue Dots; Stampin’ Dimensionals. Your attention to detail is way above and beyond — FABULOUS WORK!!!! Mary Jo, this is too pretty! Love all of your details! Oh so pretty … it looks romantic and dreamy. Perfect for a wedding day! Very pretty card!! Love those little pearlish brads! They will love it too! I know what you mean about duplicate cards…at the 50th anniversary party for my in-laws, I saw a LOT Of duplicate cards, including ours because I had left the handmade card in Texas! It’s so nice to make originals! So pretty and sweet! She’s sure to love it! Very pretty! She is a lucky lady to get such a nice and thoughtful card! ooh, such a beautiful card! This is so elegant and stunning without being overly feminine. It is fabulous and your friend is lucky to get it! Happy New Year to you and your precious family!!! I am a newcomer to your website. I fell upon it randomly and I am a SU demo. I just wanted to tell you how amazing I think you are. I don’t think I have ever seen the talent that I see on your website! This card is simply amazing. Thanks for sharing it with the rest of us.